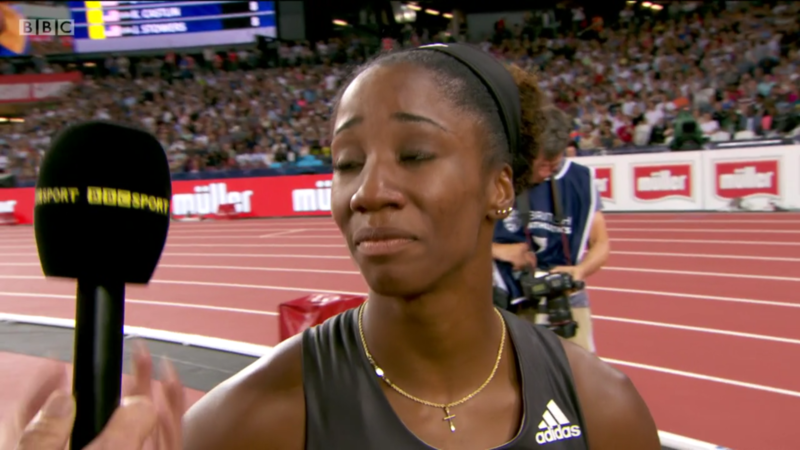 – GB Sprinter Nethaneel Mitchell-Blake explaining the post-race photo of him biting the baton after the 2017 World Champs 4 x 100 where Britain won a surprise gold in a new national record. New IAAF document with names of dopers (from 2015) set to be released? 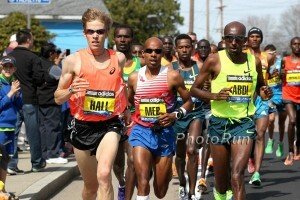 Is Daniel Komen's 3000m world record insurmountable? Transgender in D3 Conference swings tight meet, Fair Play controversy renewed. Thoughts? I am not shopping at Whole Foods any more ? LRC Big Prize Money, Big Charity Donation, But No Drug Testing: What’s Up With Chip Gaines’ Silo District Marathon? Reality TV star Chip Gaines wanted to run a marathon so he created one from scratch. Since raising money for the Brave Like Gabe Foundation was the goal, everyone – even the pros like Betsy Saina – had to pay the $150 entry fee. Saina is glad she did as she walked away with the easiest $10,000 of her life. Thursday: Defending Champ Emily Lipari Faces Cory McGee, Sarah Brown And Natalija Piliusiina At The TC 1 Mile Men’s race has Lawi Lalang, last year’s runner-up Daniel Herrara and Brandon Hudgins. 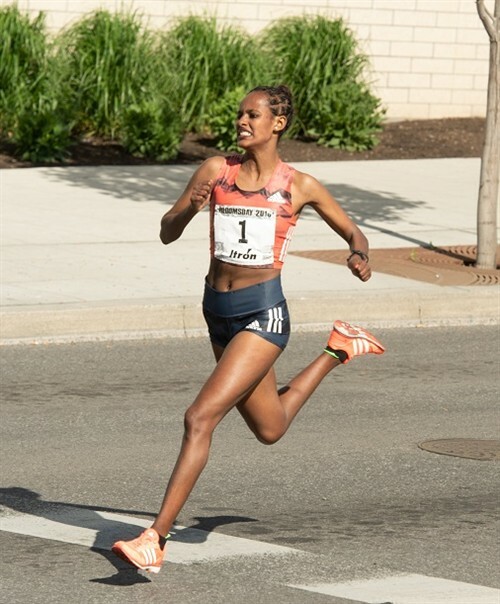 May 26: Great Matchup Set For Pre Classic 5,000 With Genzebe Dibaba Vs. Hellen Obiri And Sifan Hassan Field also has Marielle Hall, Dominique Scott, Worlds 5th placer Margaret Chelimo, World XC bronze medalist Lilian Kasait, Olympic 10k 4th placer Alice Aprot. MB: Stacked field for Pre Classic 2-mile… Paul Chelimo, Ben True, Edward Cheserek, Muktar Edris, Ryan Hill, Eric Jenkins and more. May 27: European Heptathlon Champ Anouk Vetter Joins Field For Gotzis Hypo Multi Event Meeting World gold and silver medalists Nafissatou Thiam and Carolin Schafer were previously announced. May 31: World Champ Sam Kendricks Vs Olympic Champ Thiago Braz Set For Rome Pole Vault The long jump will have World champ Luvo Manyonga and silver/bronze medalists Jarrion Lawson and Ruswahl Samaai. 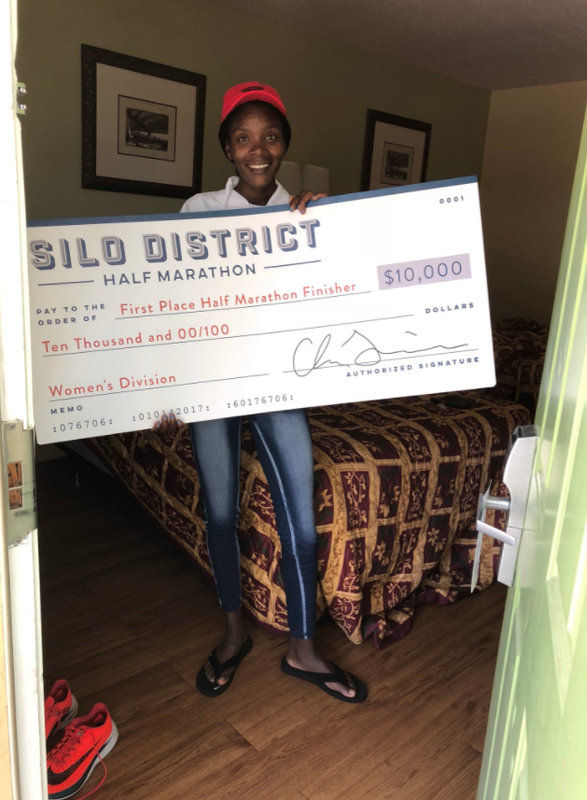 Aliphine Tuliamuk Back To Her Winning Ways (1:10:04), Chris Derrick (1:02:37) Outlasts Stinson, As Gwen Jorgensen 4th (1:10:58) At USATF Half Marathon Championships Tuliamuk took it out hard and dropped everyone, but outlasted a charge from Sara Hall at end. 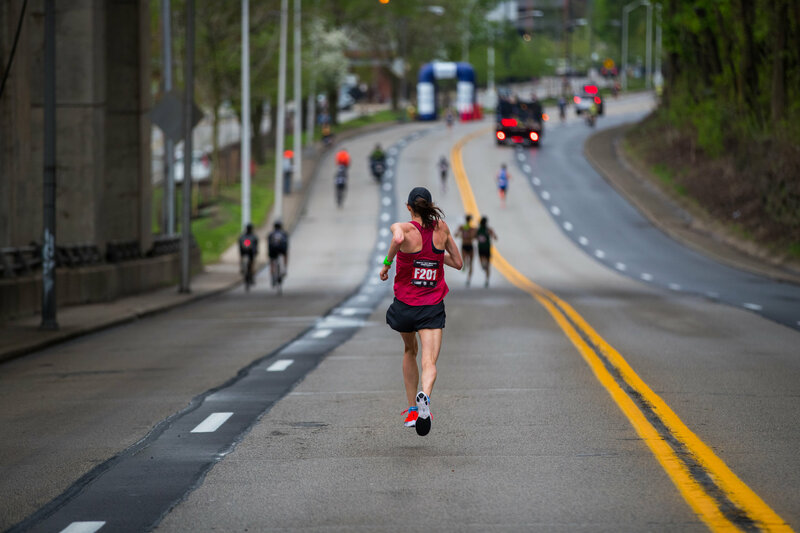 Fikadu Girma Teferi (2:13:47) And Sydney Devore (2:32:39) Win Pittsburgh Marathon Teferi beat out Kipkoech Ruto by just 5 seconds while Devore ran 2:32 in her marathon debut. *Good Profile On Sydney Devore From Last Year Devore didn’t run for over four years after college due to injury, but started back up again in 2015. 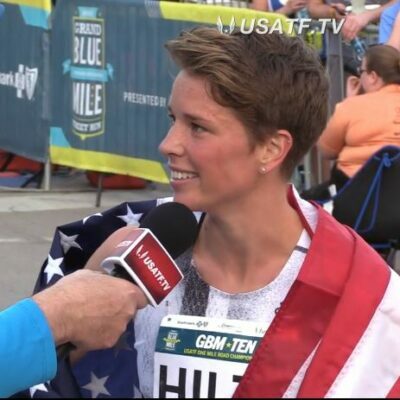 Discussion: Official Gwen Jorgensen Prediction / USATF Half Marathon Champs In Pittsburgh Thread Plus an interview with Gwen pre-race. Props To Boston: Boston Marathon Pays Out $21,700 In Prize Money To Five Non-Elite Women From Boston Five women had chip times that would get them prize money, but didn’t do the separate start with the elite field. This included 5th placer Jessica Chichester, who got $15,000 for her 5th place chip time. MB: Are You READY For the FIRST Big Event of the Year?? Yes, it’s IAAF World Race Walking Team Championships from Taicang 2018!! LRC Athletics Integrity Unit Responds: “No Mix-Up Or Tampering,” Kiprop’s “A” And “B” Samples Positive They deny Kiprop’s claims of tampering. LRC Asbel Kiprop Releases Detailed Statement Of His Innocence, Explosive Allegations Of Breaches In Testing Protocols, Implies His Sample Was Sabotaged As a message board thread says, “Kiprop responds, and it’s wild.” Kiprop states testing protocols were violated, he sent cash to a tester, and the IAAF offered him a role as an anti-doping ambassador if he admitted his guilt. None of this proves his innocence, but he deserves his day in court. 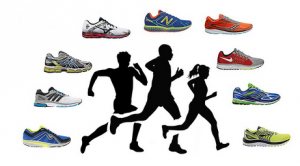 LRC Asbel Kiprop Tests Positive For EPO – What Does It Mean? 5 Takeaways The greatest 1,500 runner in a generation has reportedly tested positive for EPO. What does it mean? The Rosas certainly have more explaining to do. Doping experts, why would a distance athlete like Kiprop be on EPO at the end of the year? Kiprop the biggest bust since??? WTW Penn Still Triumphs For Collegiate Relays, Lawi Lalang Is Almost A US Citizen, Jenny Simpson Has Some Work To Do + Laura Thweatt And Anna Rohrer Are Back Penn had the crowds and the fastest collegiate times this weekend, which made us happy, and hopefully Houston gets a recruiting bump for bringing it on the national stage. Maggie Ewen Breaks NCAA Shot Put Record With 19.46m She adds this to her collegiate hammer throw record. LSU Women Remain #1 In Updated NCAA Rankings As Oregon Moves Up To 2nd Southern California and Arkansas are 3-4. No Changes To The Top 4 Men’s Teams In Updated NCAA Rankings Florida and Texas Tech are still 1-2. UTEP’s Michael Saruni And Arizona State’s Maggie Ewen Are NCAA Athletes Of The Week Saruni broke the NCAA 800 record while Ewen threw 19.46m in the SP to become the first woman since Jenny Simpson to hold two or more NCAA records at once. RRW A New Kenyan Star? 18-Year-Old Rhonex Kipruto Blasts 27:08 In Central Park To Break US All Comers 10k Record He’s only raced twice outside of Africa, but Kipruto has run 27:13 and 27:08 each time on the roads. He picked up a nice $40,000. Day3: Team USA Dominates USA Vs. The World At The Penn Relays As Raevyn Rogers Anchored The Sprint Medley Team To A New WR Rogers split 50.48 to bring the team home in 1:35.20, breaking the previous record of 1:35.59. Team USA also got a win in the men’s 4 x 100, where the Justin Gatlin-led team ran 38.39 and the men’s 4 x 400, women’s 4 x 400 and men’s SMR. Jamaica won the women’s 4 x 100. University Of Houston Has A Huge Penn Relays, Taking The Men’s 4 X 100 And 4 X 400 They won the 4 x 400 thanks to a 43.38 anchor leg from Kahmari Montgomery. His split was the fastest in Penn Relays history. Jamaica’s Calabar HS Dominates, Sweeping The Boys 4 X 100, 4 X 400 And 4 X 800 Included meet records in the 4 x 400 (3:03.79) and 4 x 800 (7:26.09). Philly.com: Villanova Concludes A Banner Penn Relays With Five Championships The Villanova men got the 4 x mile win in 16:23 to add to the DMR title while the women took the 4 x 800 in 8:19 to complete their sweep of all three distance relays for the second straight year. 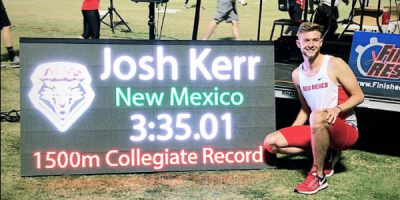 Johnny Gregorek Makes Successful Penn Relays Return With 3:54.94 Olympic Development Mile Win It was the 3rd-fastest mile in Penn Relays history. In the women’s mile, Charlene Lipsey won in 4:31.19 as Ajee Wilson was 3rd (4:35.75). Day 2 Penn Recap By Philly.com: Inspired By Women’s Team’s Dominance, Villanova Men Win Distance Medley Relay At Penn Relays The ‘Nova men hadn’t won the men’s DMR since 2011. The Villanova women and Nicole Hutchinson continued to roll in the women’s 4 x 1,500. MB: Isaiah Harris gets stick down by nearly 4 seconds, guy in leads runs 1:48 but Harris wins thanks to 1:44.74 The MB poster thinks it’s one of the best relay carries in Penn Relays history. MB: Casey Comber gives Nova upset win in men’s DMR He went from from 3rd to 1st, Notre Dame 2nd, Princeton third. 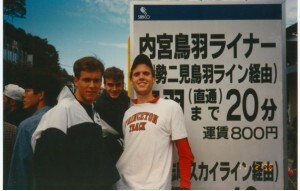 Recommended Read: Former Irish 3-Time Olympian Eamonn Coghlan Looks Back At When He Ran His First Sub-4 Mile At The Penn Relays It wasn’t his “official” first since it was anchor leg for the Villanova DMR. Villanova Women’s DMR Wins DMR Yet Again That’s 6 out of 7 thanks to a dominant 1,200 leg by Nicole Hutchinson. LRC Meet the Guy Who Picked Both Des Linden and Yuki Kawauchi to Win The Boston Marathon Plus, the former head of Brooks Sports Marketing, Jesse Williams, believed in Des Linden and finished top 3, to win a pair of adidas sub 2 shoes. And another guy finished top 3 in the Boston and London contest. GB Sprinter Nethaneel Mitchell-Blake Explains The Story Behind The Photo Of Him Biting A Baton In His Mouth Mitchell Blake walks through the build-up to the team’s golden run and the anxiety of waiting to see if they won gold. LRC Distance Recap Caster Semenya Sub-4 For First Time, 17-Year-Old George Manangoi 3:35.53, Emmanuel Korir Wins, Jenny Simpson Comes Up Short Of AR, Murphy 1:47 Caster Semenya went sub-4 for the first time, 17-year-old George Manangoi ran 3:35.5, and Emmanuel Korir got another win and Jenny Simpson came up short. LRC 20-Year-Old Noah Lyles Runs 19.83 To Stay Undefeated In Diamond League – “My goal is just to dominate.” Race video as well. LRC Doha Sprint & Field Recap: Noah Lyles, Steven Gardiner, Ta Lou, Keni Harrison Run Fast, Pichardo, Röhler, Perkovic Excel Eight world leads start the 2018 Diamond League season off right. Marathon for World Champs in Doha will be at Midnight! LRC 17-Year-Old Jakob Ingebrigtsen Destroys Paul Chelimo And Matthew Centrowitz To Win Payton Jordan 1,500m Jim Ryun and Alan Webb have to be proud. In other action, Henrik Ingebrigtsen (Jakob’s brother) won the 5k over Riley Masters, Sara Vaughn won the 1,500, and Shadrack Kipchirchir won the 10,000. Listen On Demand: LRC Podcast: Kiprop Tests Positive, Rupp Is Running Prague, USATF Pulls Trials From Mt. SAC + Gwen Jorgensen Is Running USATF Half Listen via soundcloud, itunes, Stithcher, or via download. Here We Go: Athletics South Africa To Challenge IAAF Hyperandrogenism Rules They say they’ll first talk with the IAAF and then CAS. The Guardian: “The Treatment Of Caster Semenya Shows Athletics’ Bias Against Women Of Color” We completely disagree that the IAAF is driven by racism or sexism against Semenya. The article makes one good point though: why isn’t the IAAF going after other events where intersex athletes also have an advantage? 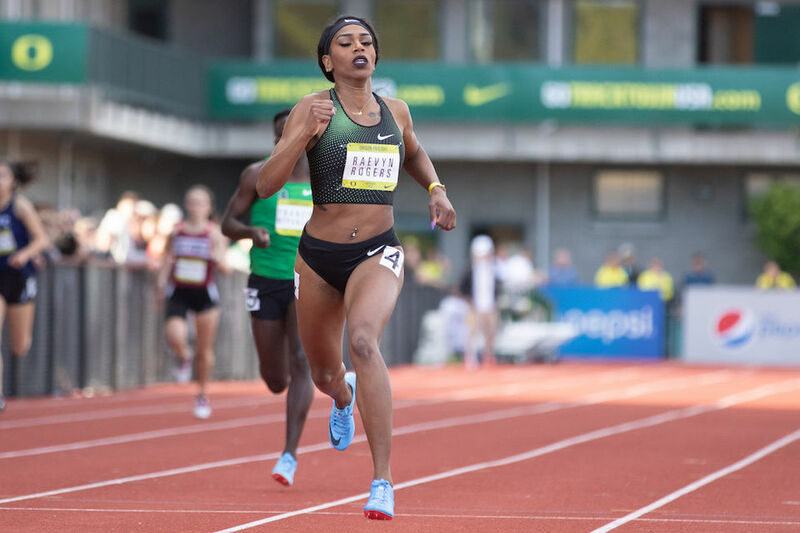 Former 100H Olympic Champ Dawn Harper Nelson Is Going To Retire After The 2018 Season 33-year-old Harper Nelson says she wants to retire to start a family. 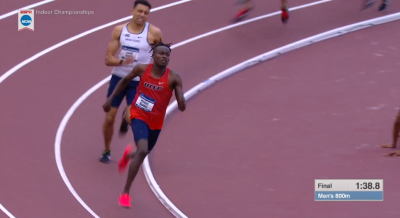 MB: Michael Saruni Runs 1:43.25 To Break Donavan Brazier’s NCAA 800m Record At Arizona’s Desert Heat Classic Saruni ran over a second PR to break Brazier’s 1:43.55 mark from 2016. Sydney McLaughlin Breaks Her World Junior 400H Record With 53.60 At The “National Relay Championships” In Arkansas McLaughlin took .22 seconds off her own record in her first 400H as a collegian (she’s now #4 all-time NCAA). Stanford Runs #3 Collegiate SMR Of All-Time With 3:41.59 To Win In Arkansas Included a 2:00.09 anchor leg from Olivia Baker. 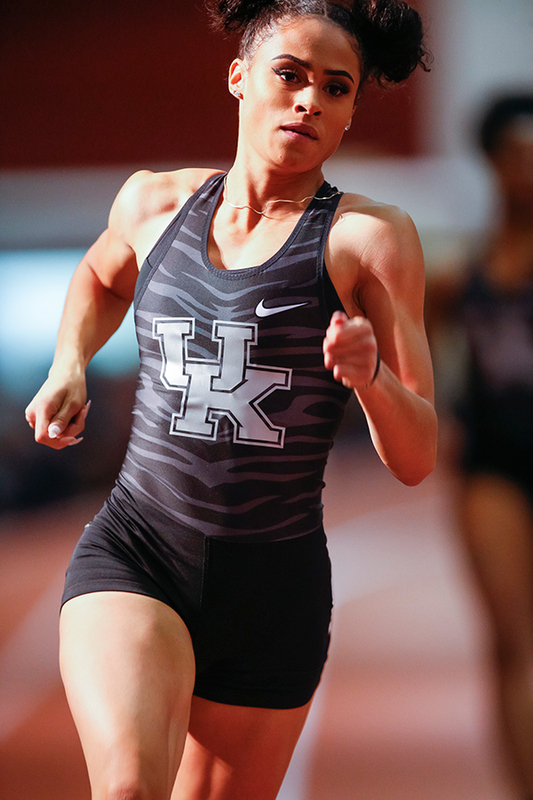 Arkansas Men And Kentucky Women Win National Relay Championships Sydney McLaughlin followed up her first day 400H WJ record with a 49.47 split on Kentucky’s winning 4 x 400. 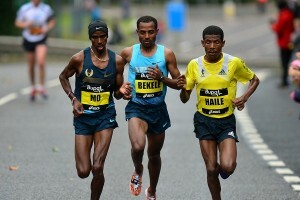 IAAF Article Includes video of the race. LRC Galen Rupp Runs 2:06:07 To Smash PR And Win Prague Marathon And he vomited at the finish to make it more legendary. 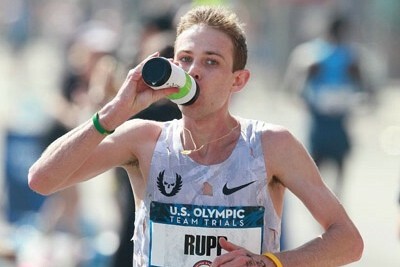 Discuss: RUPP IS OFFICIALLY A 2:06 GUY – 2:06:07 Amazing! Shelly-Ann Fraser-Pryce Returns From Pregnancy With 11.52 Second 100m In Jamaica It was her first race in over a year. She won her heat in her first race in over a year, but Shericka Jackson had the fastest time of the day in 11.31. Javon Francis (20.60) and Stephenie-Ann McPherson (23.02) won the 200s. 2019 Doha World Championships Will Have A Mixed 4 X 400 Relay And Midnight Marathons The men’s and women’s marathons will start at midnight (we assume to beat the Doha heat) and morning sessions are being scrapped in favor of split evening sessions. Shadrack Kipchirchir Leaves US Army WCAP To Sign With Nike After four years, Kipchirchir has fulfilled his military obligations and decided not to re-enlist, but will continue training with the American Distance Project under Scott Simmons. 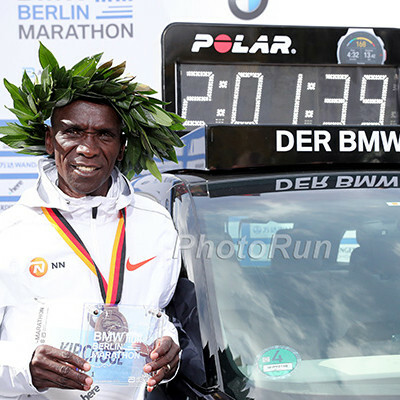 MB: Kipchoge won’t run again in 2018? Possible second Breaking 2? This article is reporting Kipchoge won’t race again in 2018 and instead train for a WR attempt. A Missed Result: Yuki Kawauchi Wins Kawauchi Half Marathon For Third Straight Year He ran 65:54 to win the race named not for him, but for the village where it takes place. Will They Ever Learn? Neutral Athlete Status Of Five Russian Racewalkers Revoked; Will Now Miss This Weekend’s World Walking Cup This after the athletes allegedly participated in a training camp with banned for life doping coach Viktor Chegin. IOC To Appeal CAS Decision To Overturn Sanctions Against 28 Russian Athletes The chances of overturning CAS is a long shot, but the IOC are likely to argue the burden of absolute proof used by CAS was a criminal standard rather than the “beyond reasonable doubt” criteria usually applied in doping cases. IOC Plans Medal Reallocation Ceremonies To Honor Athletes Who Lost Medals To Dopers The IOC say medals will be reallocated within 12 months of the end of legal proceedings and the athletes can choose their ceremony. LRC History Of Prize Money At The Olympic Marathon Trials Last week it was announced that the 2020 US Marathon Trials will be hosted by the Atlanta Track Club in Atlanta, Georgia and that with “B” qualifiers getting their travel paid for, more money will go back to the athletes. The more inclusive approach of the 2020 Trials inspired us to go back and look at what the past Olympic Marathon Trials did in terms of paying prize money. 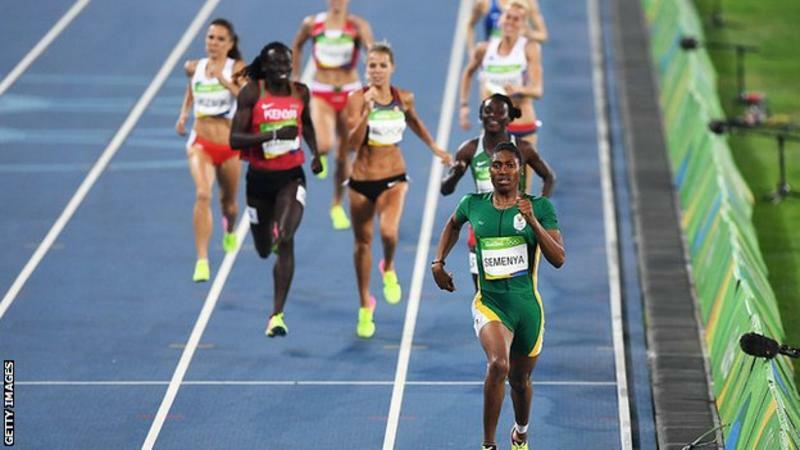 BBC: African National Congress Says IAAF Testosterone Ruling “A Painful Reminder” Of Apartheid-Era South Africa Anyone trying to make this out to be “racist” should remember that the woman who stands the most to gain by this rule is Ajee Wilson. Athletics Canada “Has Serious Concerns” With The IAAF’s New Hyperandrogenism Rule “In Canada, we encourage the full access for all Canadians to participate and compete in athletics …” This is a ironic statement considering they often prevent their own athletes from competing at major championships even when they’ve met IAAF standards. Saturday Recap: Keni Harrison Wins Her 3rd Straight Drake Relays 100H Title Harrison won in a wind-aided 12.37 becoming the first to win the event three times in a row since Lolo Jones. Isiah Young won the men’s 100 in 10.02 as Andre De Grasse ran his first race since tearing his hamstring last summer (4th in 10.15). Sandi Morris cleared 4.88m in the PV to beat out Jenn Suhr and Katie Nageotte while Devon Allen won over Aries Merritt in the 110H, Ryan Crouser took the SP and Georganne Moline won the 400H over Olympic champ Dalilah Muhammad. Eric Avila Just Beats Out Drew Hunter By .02 To Win Drake Mile Avila ran 3:58.81 to Hunter’s 3:58.83 while Brannon Kidder (3:59.86) and Leo Manzano (4:00.49) were 3-4. 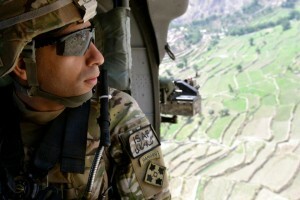 *MB: LEO MANZANO IS BACK BABY!! IAAF Recap: Ryan Crouser Debuts With 22.01m This was Crouser’s first competition since returning from a hand injury and he fouled five out of six throws, but still beat World champ Tom Walsh. Video Clips: Drake Saturday Athlete Quotes Hear from Keni Harrison, Ryan Crouser, Devon Allen and Eric Avila. MB: Jenny Simpson Just Crushed The US Outdoor Record For 2 Miles (At) Drake With 9:16.78! She won by 15+ seconds and ran 63 for her final 400. Will she be able to break Mary Slaney‘s 8:25 American 3,000 record, which has stood since 1985, next Friday in Doha? *Des Moines Register: Iowan-Born Jenny Simpson Delivers American 2-Mile Record (9:16.78) As A Gift To Drake Relays Fans “It feels like these people have been on a journey with me,” said Simpson, who was born in Webster City and has won all 11 of her Drake races. “I felt a story here and the fans are a big part of it.” Iowa State won both the men’s and women’s 4 x 800s in 7:27.98 and 8:36.51. Video Clips: Friday Athlete Quotes Watch clips from Jenny Simpson, Vashti Cunningham and Sam Kendricks. Investigators Say Top Russian Racewalkers Are Still Working With Infamous Banned Coach Viktor Chegin You can’t see our faces, but we’re shocked. Russian Decathlete Alexander Pogorelov Stripped Of His 2009 World Bronze For Doping After Retested Sample Comes Back Positive He also received a pointless ban considering he retired years ago.